Comprehensive, authoritative, and student-friendly, longtime market-leader BUSINESS LAW: TEXT AND CASES delivers an ideal blend of classic “black letter law” and cutting-edge coverage of contemporary issues and cases. BUSINESS LAW continues to set the standard for excellence. The text offers a strong student orientation, making the law accessible, interesting, and relevant. 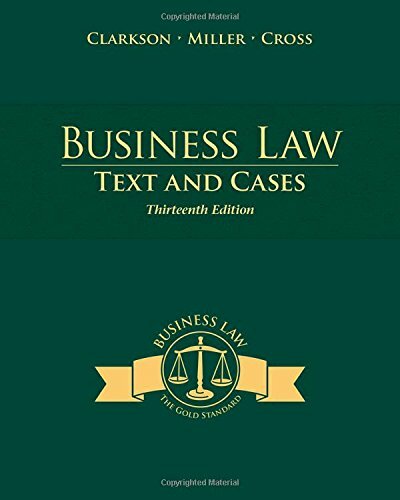 The cases, content, and features of the thirteenth edition have been thoroughly updated to represent the latest developments in business law. Cases range from precedent-setting landmarks to important recent decisions. Ethical, global, and corporate themes are integrated throughout. In addition, numerous critical-thinking exercises challenge students to apply knowledge to real-world issues. It is no wonder that BUSINESS LAW is used by more colleges and universities than any other business law text.